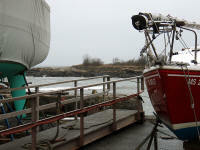 I met Ralph, owner of the three boatyards in town, down there. 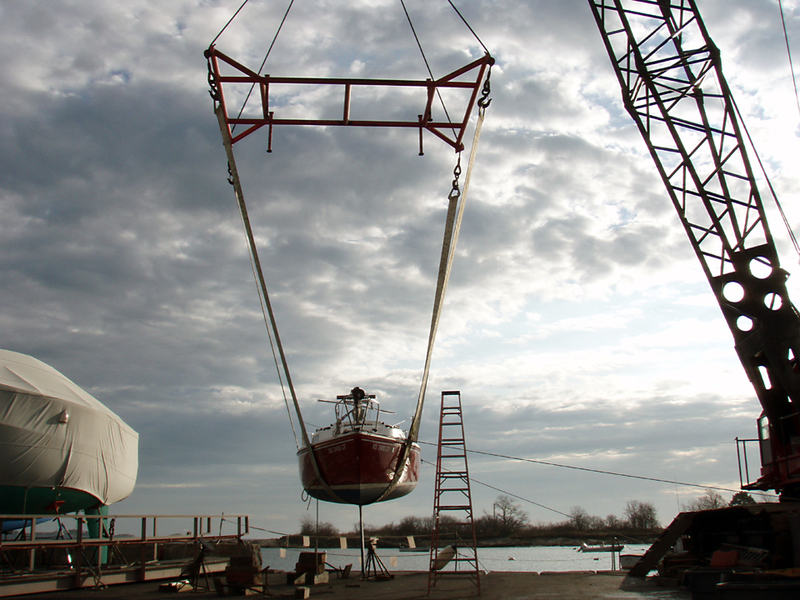 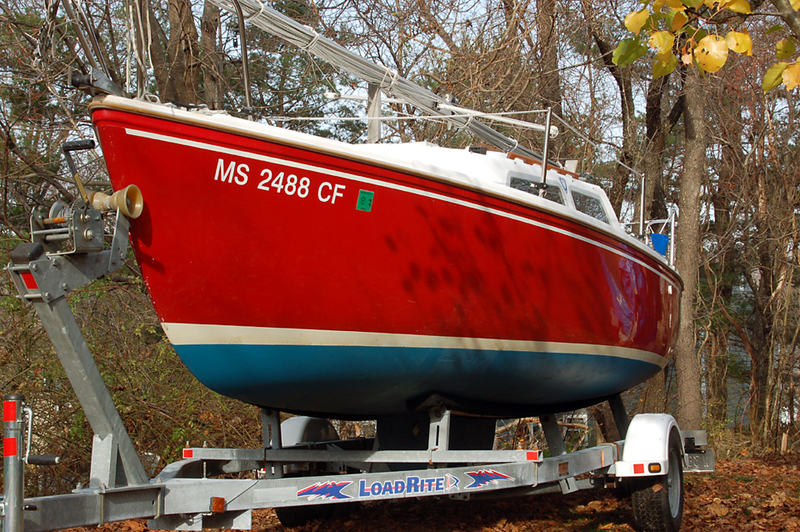 He talked me out of raising the water line -- suggested instead that come spring I rearrange weight aboard, move as much as possible more forward. 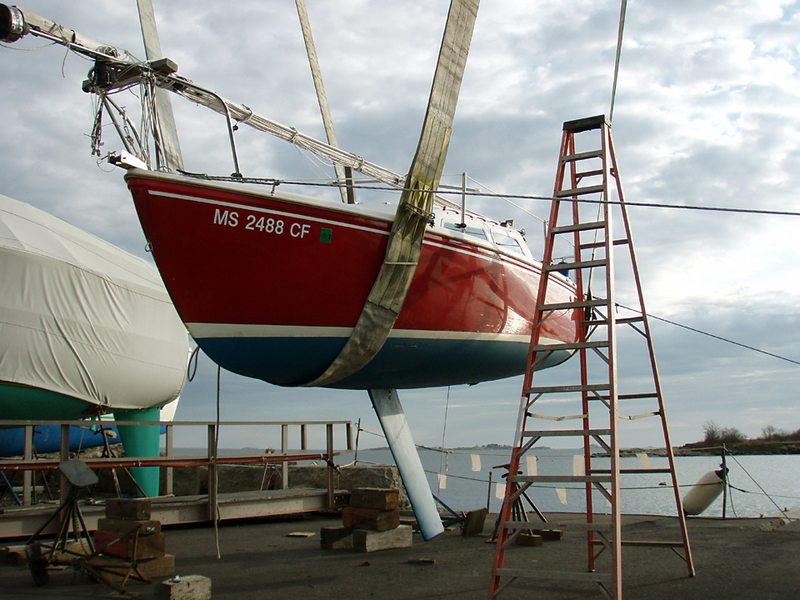 He thought I'd permanently ruin the boat's lines if I changed its water line -- suggested that I get a lighter motor or a bigger boat! 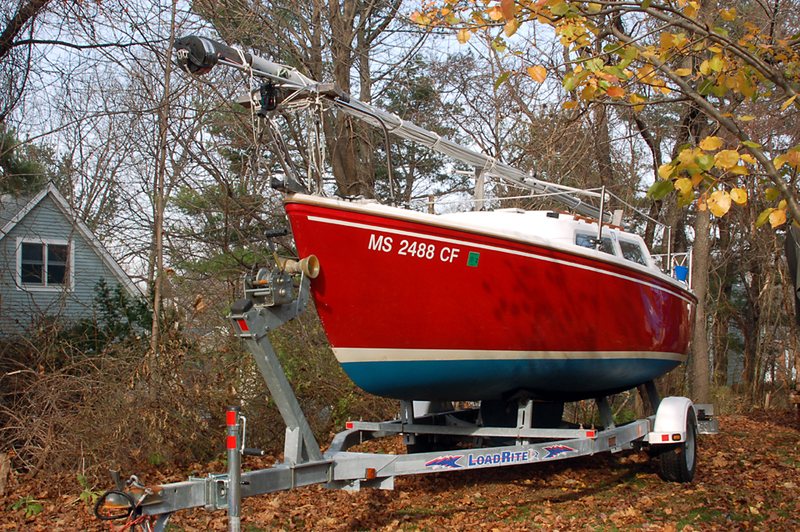 That's not going to happen, but weight aboard can be shifted somewhat even if I must leave ashore a lot of things I don't often need or use, at least until my extended cruises. 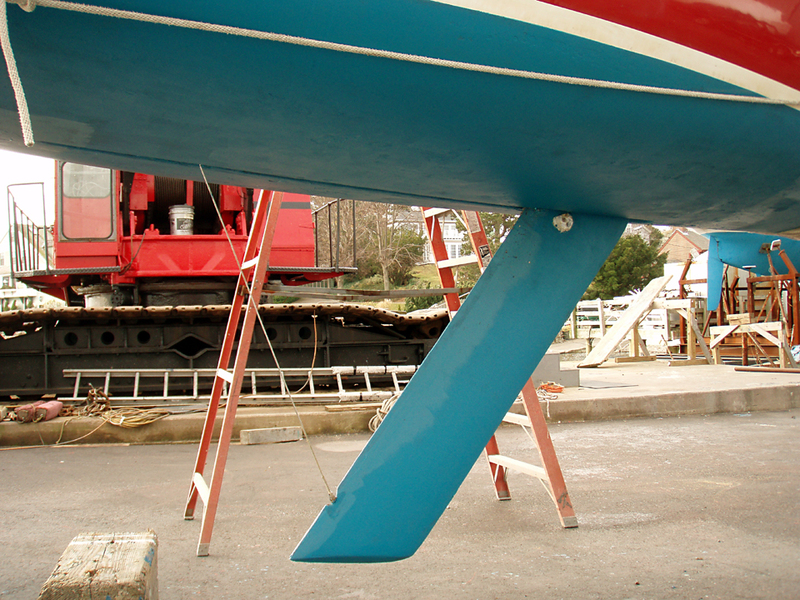 It still needs a good sanding of many layers of old bottom paint to reach smooth, then painted. 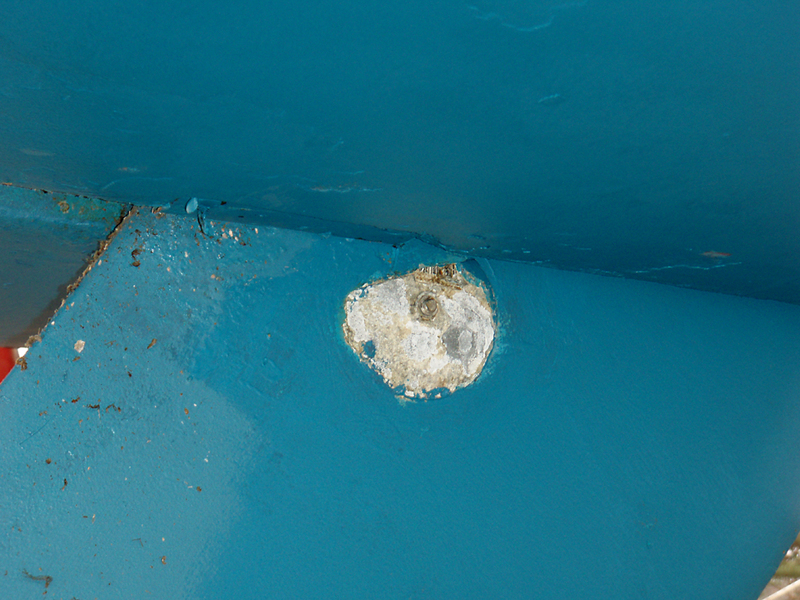 Just cleaned -- that beard of growth and barnacle acne blasted off -- it looks much better already. 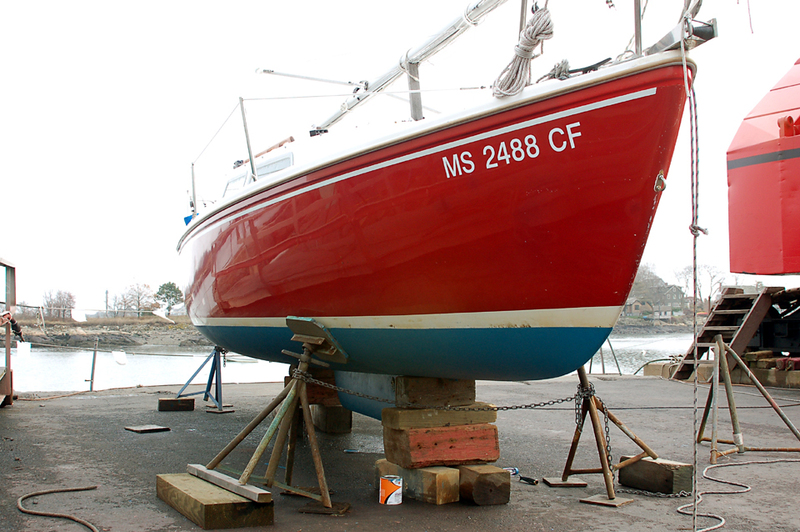 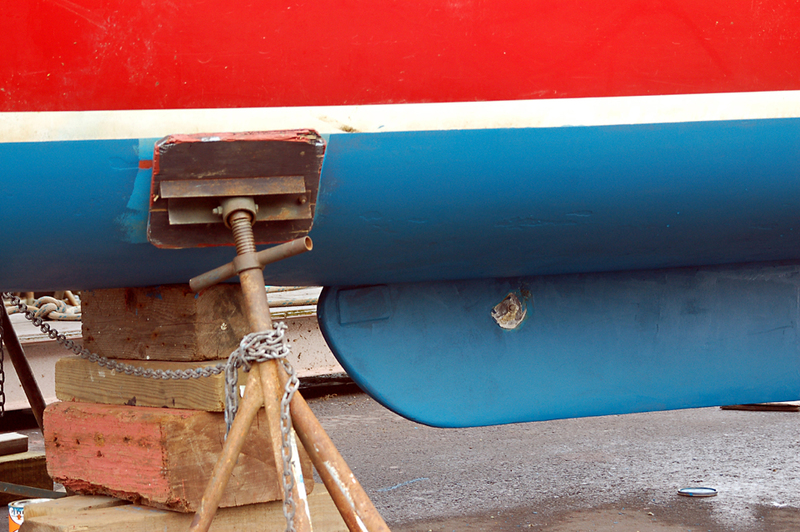 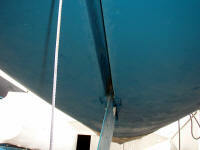 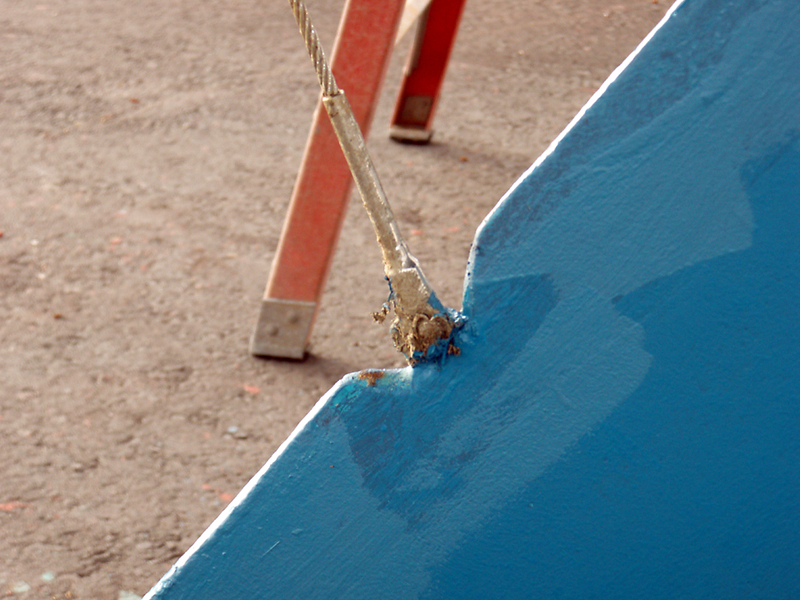 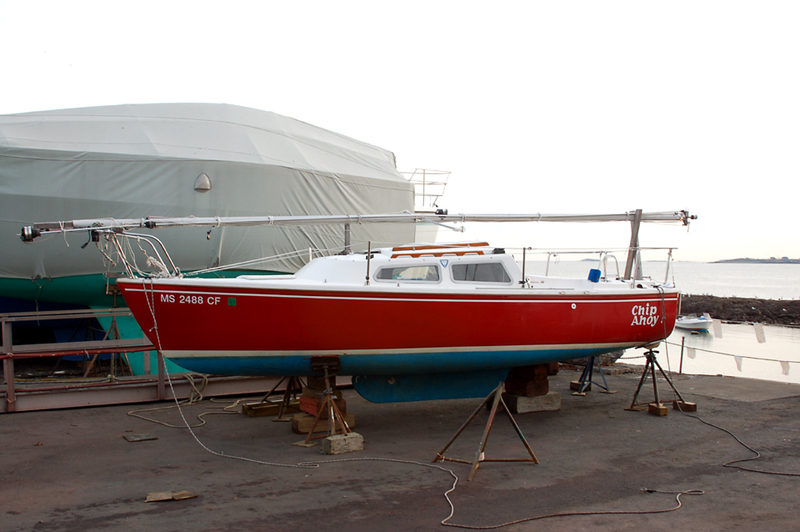 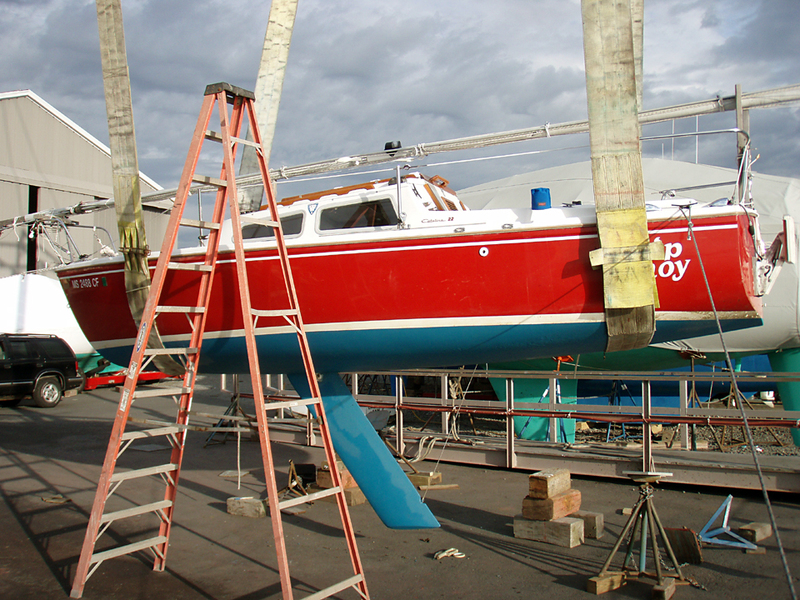 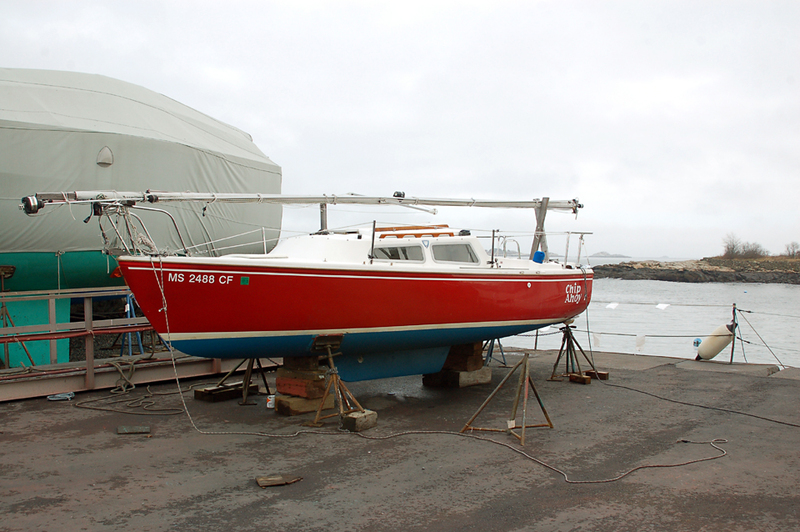 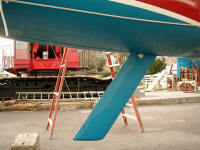 The keel looks great, though the trailing edge that winches up into the slot still needs a coat of fresh paint. 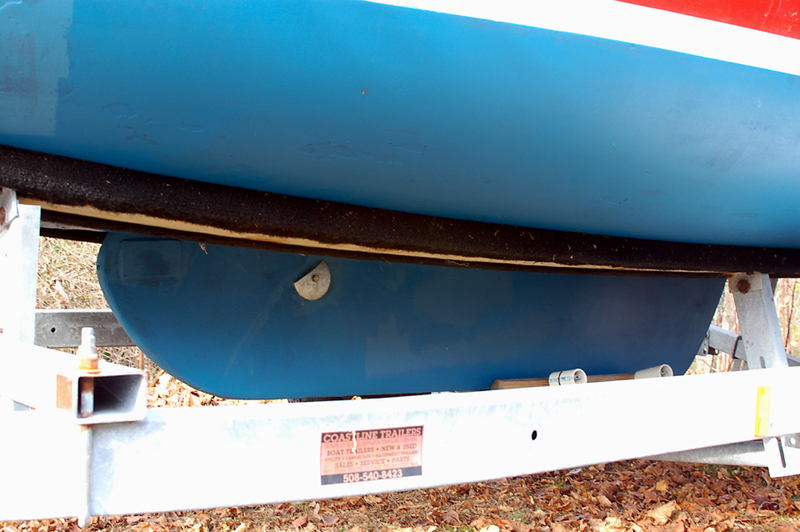 The bottom is vastly improved from when I delivered the boat. 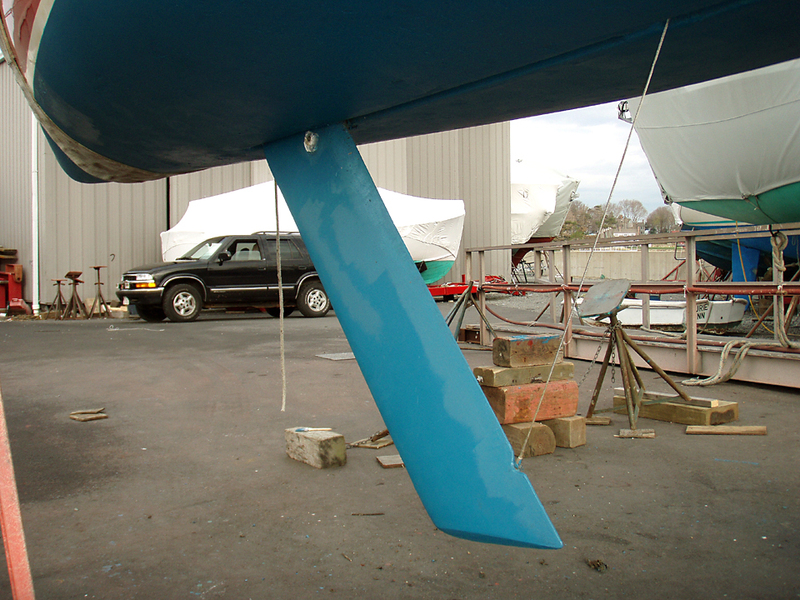 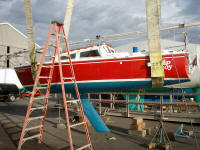 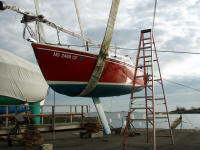 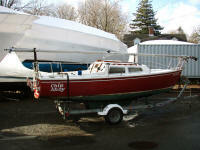 I inspected the keel slot and it was clean and painted. 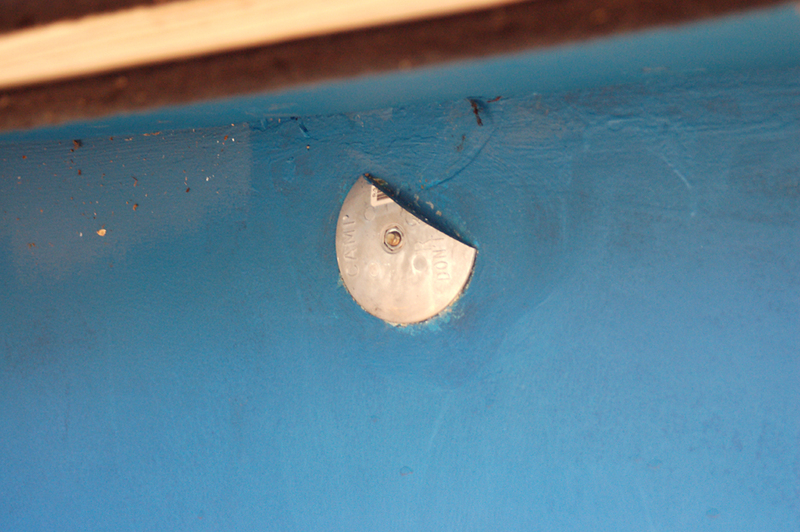 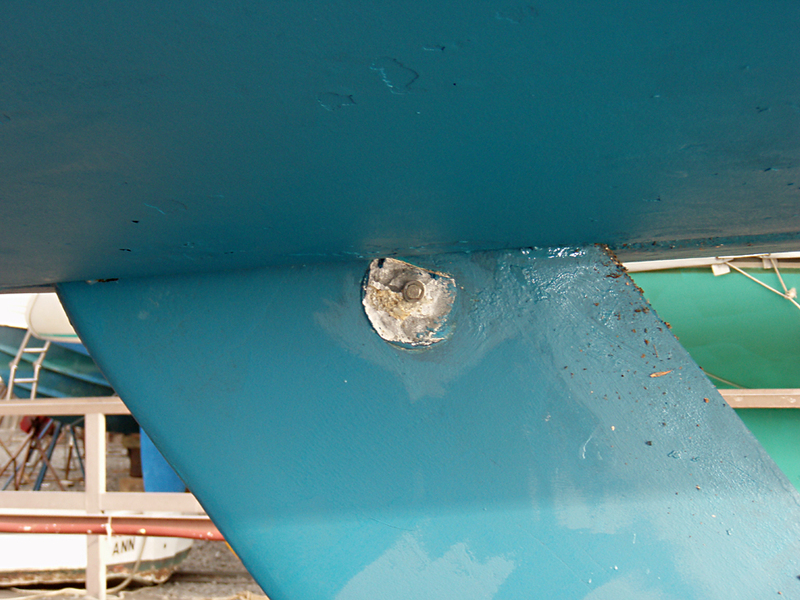 From what I could see of it, the keel cable and its eye bolt (replaced new in the spring of 2008) still look to be in good condition. 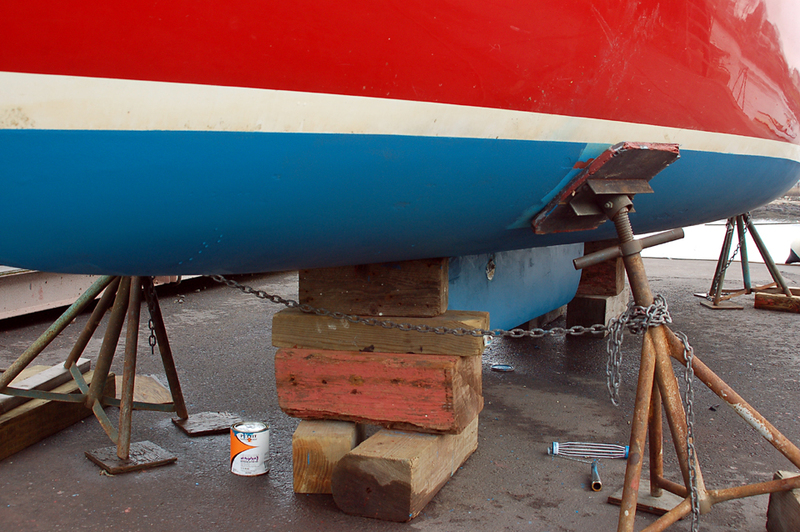 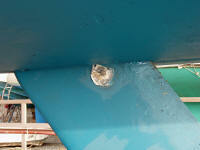 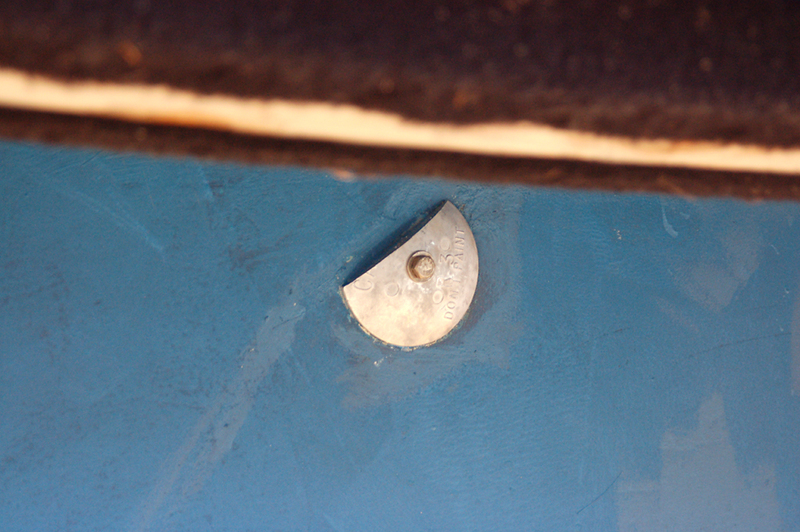 The zincs on the keel were pretty deteriorated after two seasons. 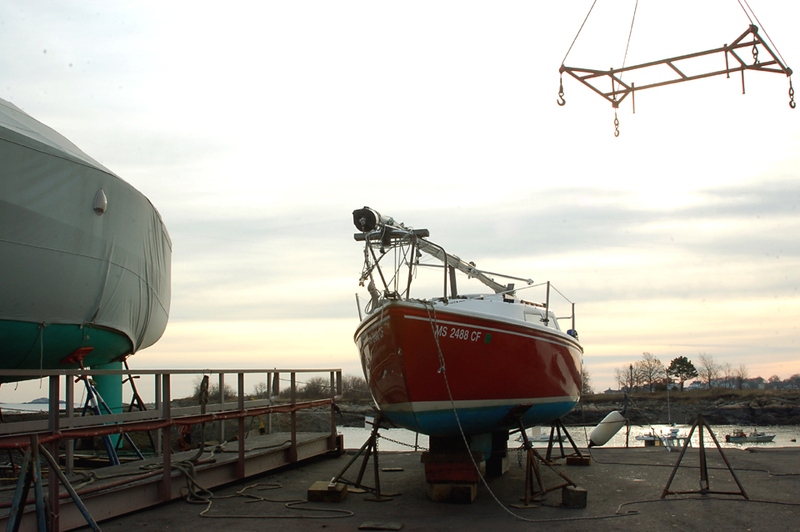 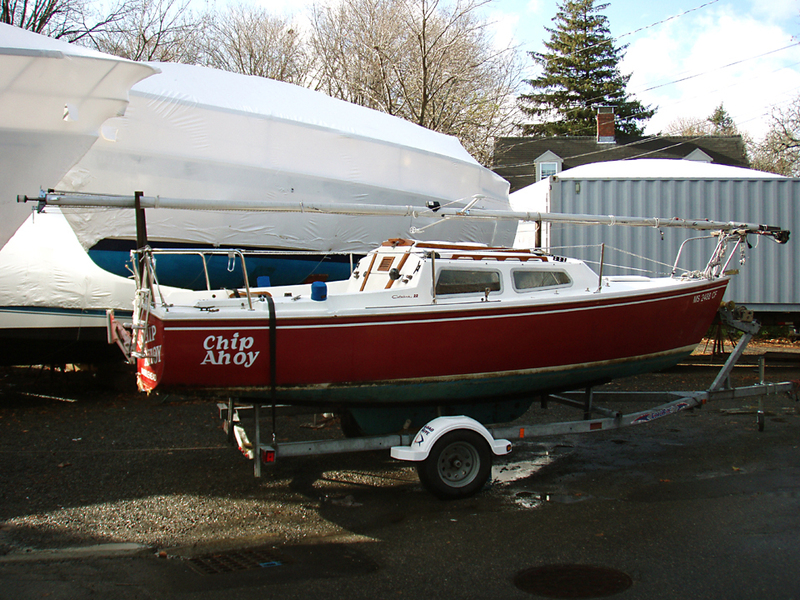 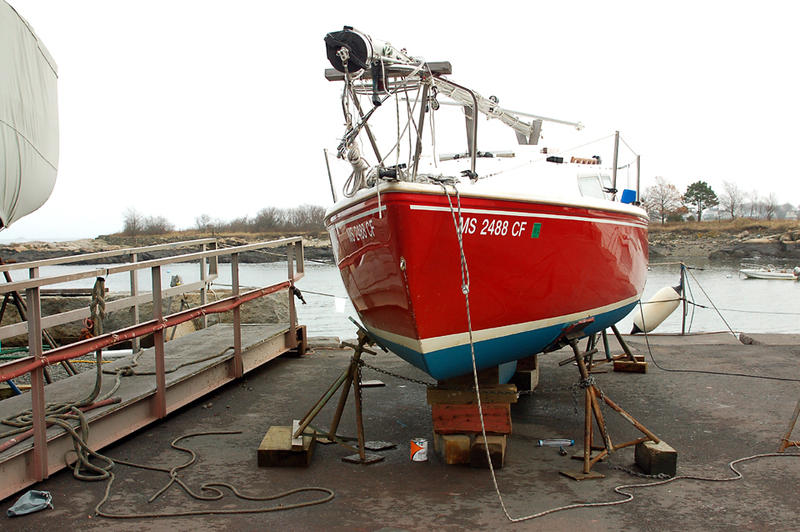 After all the work Tommy did to eliminate the keel thunk, and my cost for having it done, I arranged with him to have the zincs replaced. 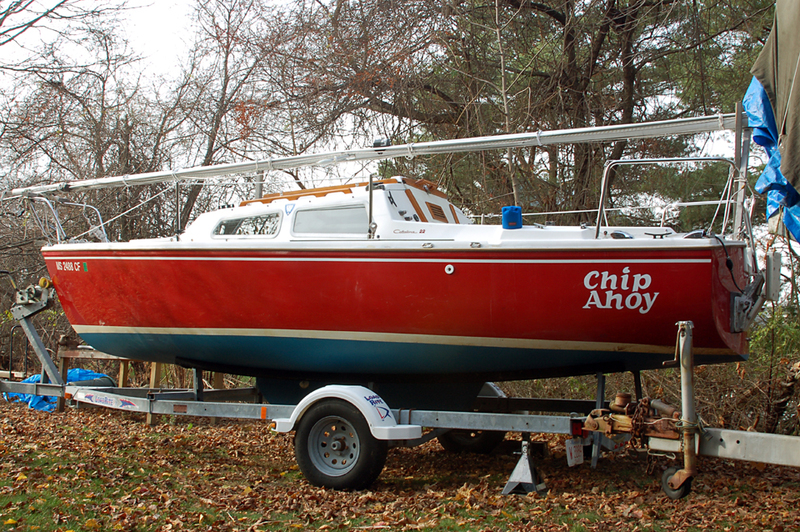 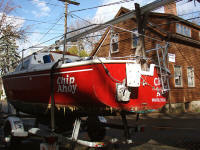 He told me Chip Ahoy would be ready to trailer home as soon as the new zincs were trimmed down and installed. 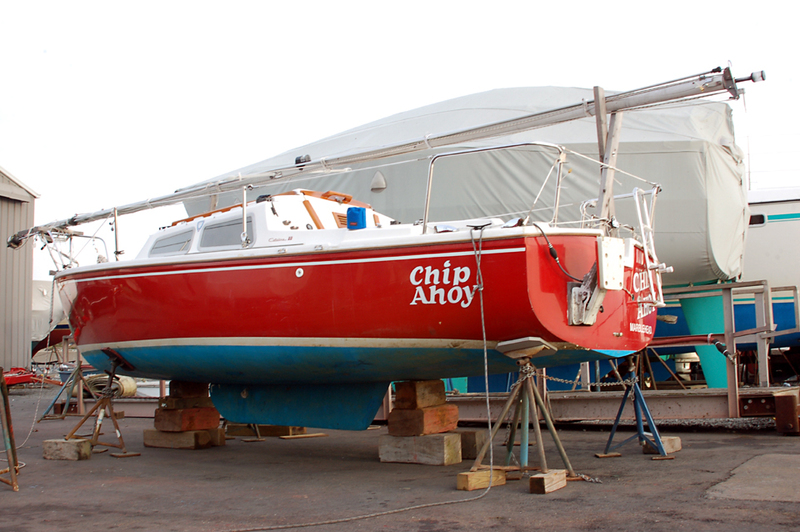 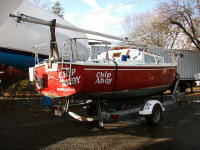 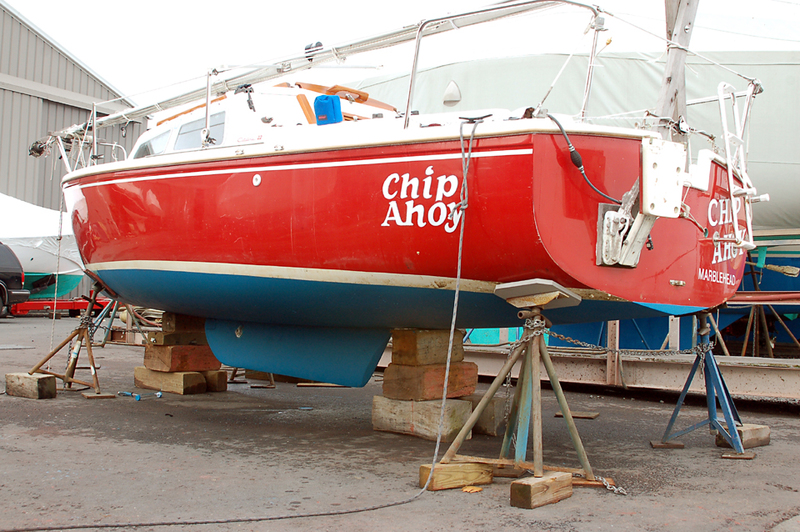 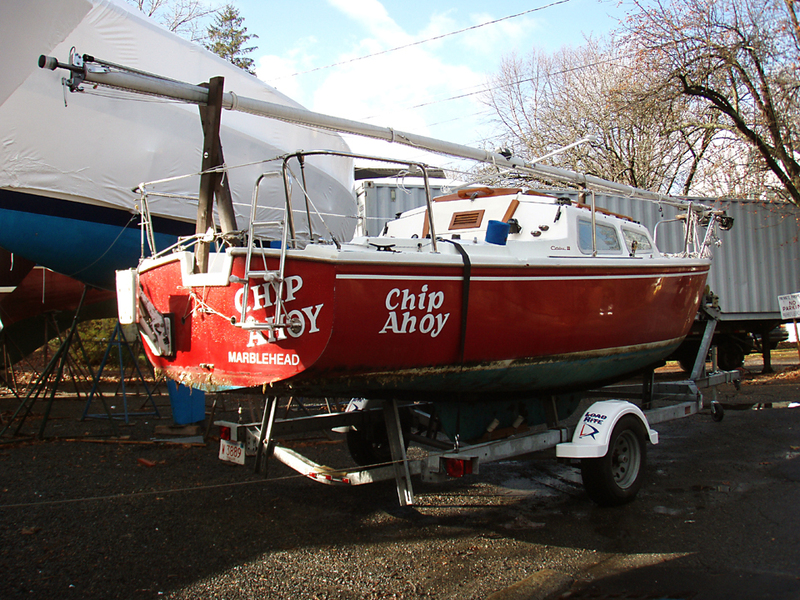 Chip Ahoy with its bottom ready to splash come spring, parked in its usual off-season location alongside the house. 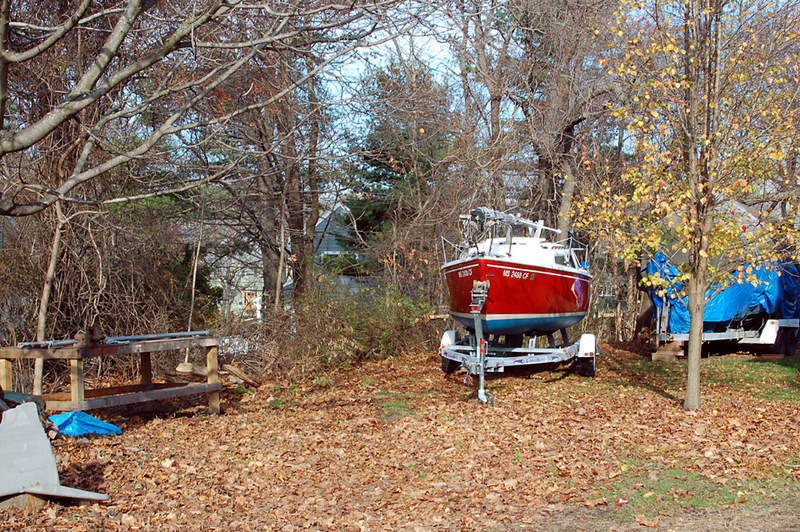 Next I'll remove the window frames and glass, bring them indoors for this winter's inside project. 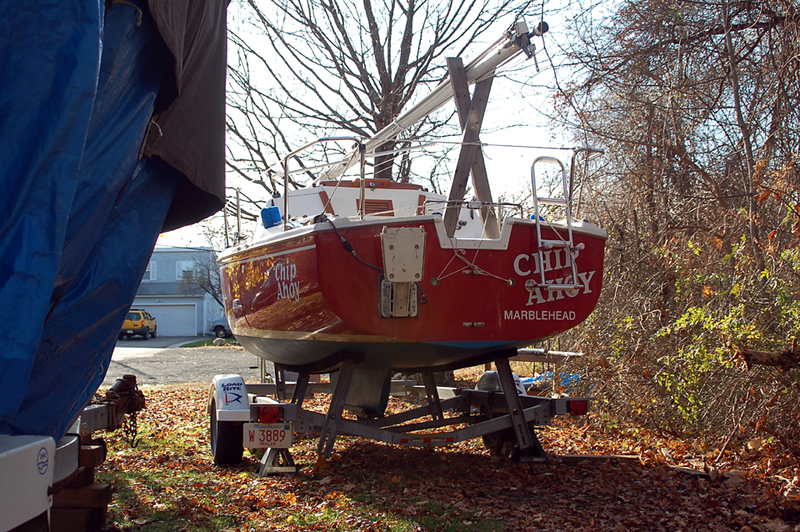 Once I have them out, it's time to get the boat covered before the first snowfall.